Every year, we are blessed with both the most outrageous and the most underwhelming celebrity fashions at the Met Gala. It's kind of like the Oscars, except you don't have to watch anything after the red carpet. 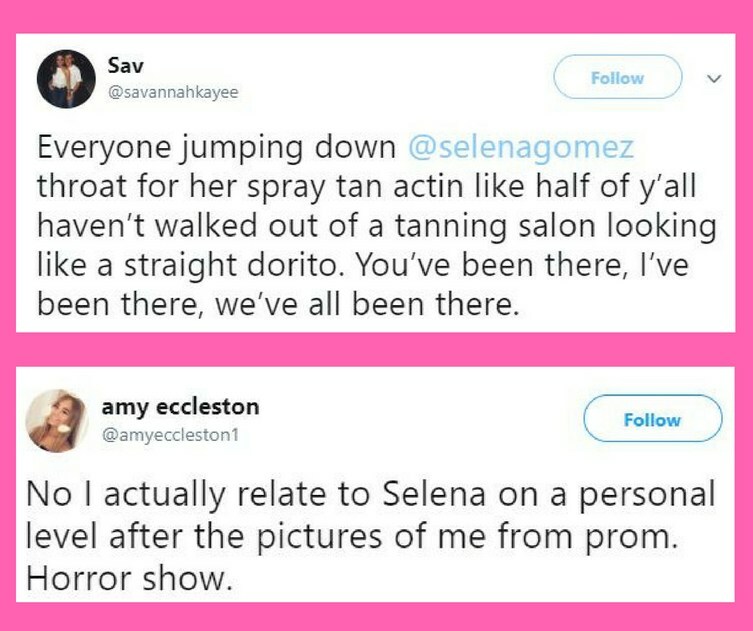 As always, this year gave us a ton of drama, especially about Selena Gomez's unfortunate spray tan. As per tradition, I spent this year's Met Gala loudly judging the fashion choices of famous people while wearing sweatpants and eating junk food. 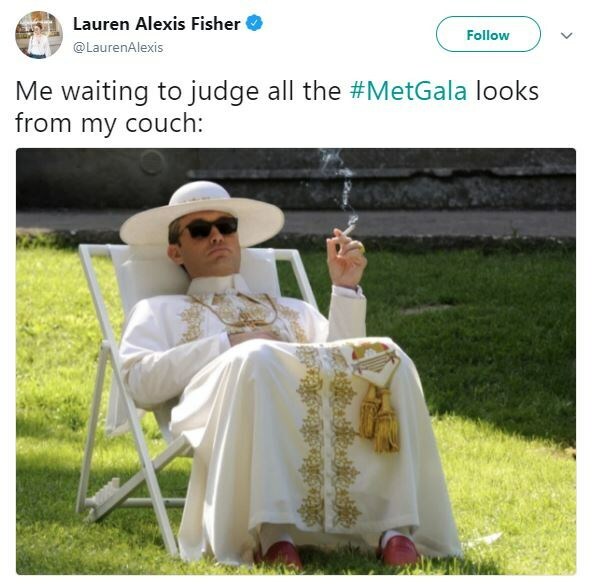 If you weren't screaming at your TV and scrolling through Twitter while dressed like human garbage, then did you really watch the Met Gala? As usual, only a handful of celebrities actually pulled out all the stops for the theme. In other news: Rihanna is the pope now. Let's also take a moment to appreciate Chadwick Boseman, SZA, Frances McDormand, and Zendaya because they actually put in the work and served up the Met Gala looks that we deserve. It's the Met Gala. So obviously, many of the fashion choices have sparked a ton of debate, memes, and praise online. I legitimately don't know what happens at the Met Gala, and I don't care to know. Is there an actual event? Who knows? I prefer to believe it's just a super extra red carpet and then everyone goes home. However, when Selena Gomez stepped onto the red carpet, her look got people talking about something other than her outfit. Let me just say that while Selena looked gorgeous, it was impossible not to notice that she was looking a little more bronzed than usual. People on social media were quick to notice that Selena was sporting a less-than-subtle spray tan. You're probably aware that the internet loves to drag celebs. 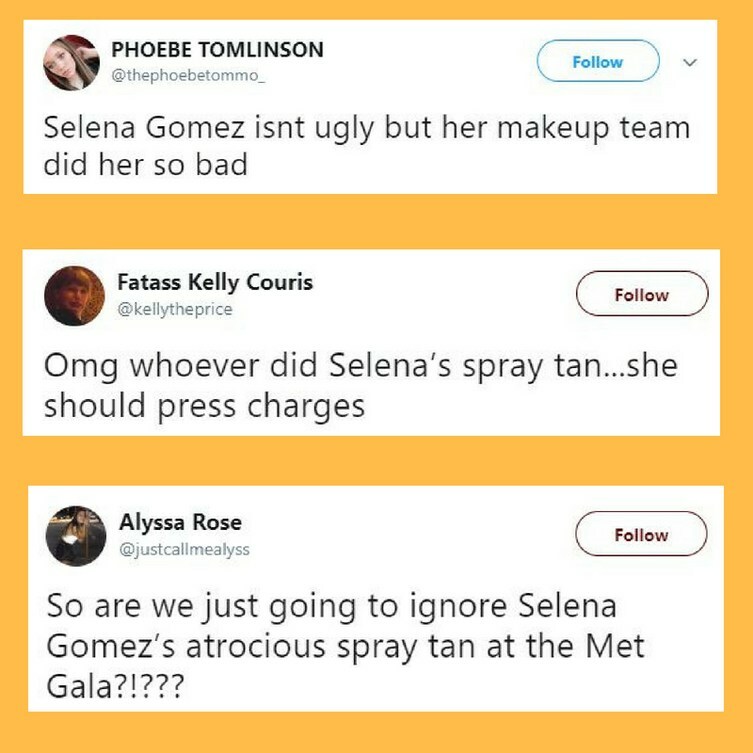 Everyone was already in Judge Judy-mode because of the Met Gala, so Selena's tan was pretty ruthlessly roasted. 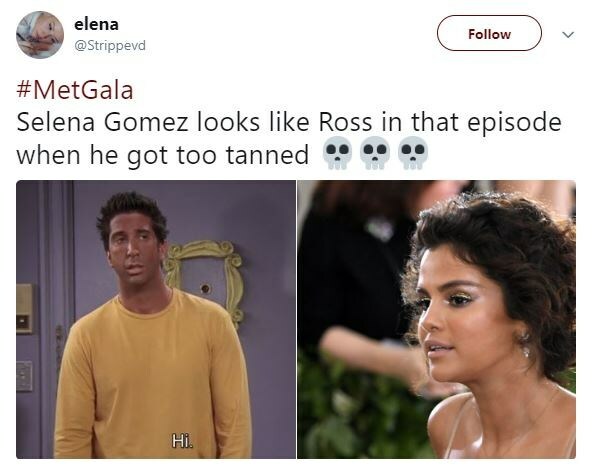 Of course, people couldn't help but recall an iconic episode of Friends where Ross attempted to get a subtle spray tan. Spoiler alert: Ross's tan was not subtle. Apparently, Selena also counts Mississippis in the spray-tan booth. A rookie mistake, really. Honestly, the best part of this whole drama was when people started sharing their own spray tan horror stories. The Met Gala and people sharing embarrassing stories? Don't mind if I do! This was a truly a perfect evening for me because I am judgmental, and I love laughing at other people's shame. Selena, of course, was unbothered by the trolls. I'm sure Selena was more than aware of what shade she was when she stepped onto the red carpet. 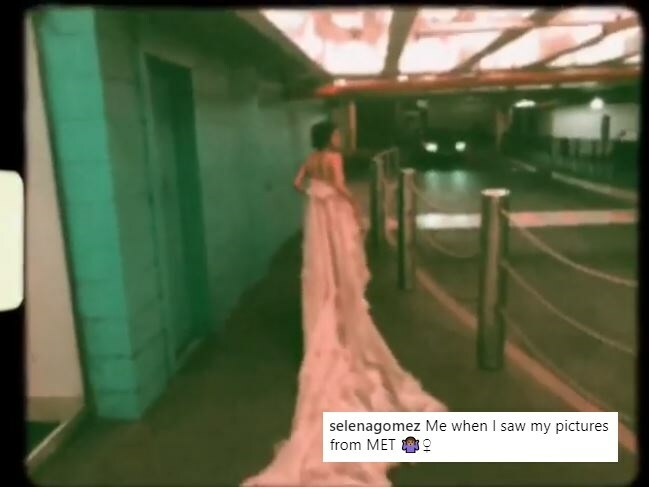 And because Selena is a gem, she let her fans know that she was in on the joke by posting a video of her literally running away from her Met Gala photos. Who among us hasn't regretted a fashion decision? There are many photos of me from the early 2000s (a truly brutal era for fashion) that I would very much like to burn. TBH, I love when celebs have moments like this because it reminds me that they are, in fact, human. Selena got a bad spray tan just like 50% of the girls from my high school the night before prom, and I love it. Spray tan or no spray tan, Selena still slayed. I mean, it was the Met Gala, so anything goes! Selena's tan was far from the most outrageous or eye-catching thing on the red carpet. Maybe it was deliberate! Who knows? In conclusion, getting a spray tan is risky business. You all really need to watch more Friends. As a rule, don't get a spray tan unless you know how to laugh at yourself. Have you had a horrible spray-tan experience? COMMENT and let us know, and TAG a friend!